Through the years I have been asked to review a good many books on topics from microbiology, to evolution, biomedical ethics, spirituality, and even the life of Cardinal Newman. It’s always a privilege to do so, to be a part of the birthing of an author’s dream, to help bring forward an idea, a perspective, or message that will have great consequence in the lives of readers. Earlier this year I was asked to do just that for a series of children’s books released a week ago by Feiwel and Friends, an imprint of Macmillan Publishing, a series that every parent of a young child can and should support. What was different was that I was approached directly by the author, Mike Lane, and the author is my friend. This is a story that just doesn’t happen to new authors, and has happened to the most deserving married couple I’ve ever known. It involves a first-time author, whose work is just the sort that we parents dream of our children reading, that has been picked up by Scholastic Books, and recommended by the Junior Library Guild months before its release date. It’s good, clean fun. Nothing dark, or brooding, or frightening, or edgy. It’s old school, “How’d he do that?” kind of magic. It starts with fun and leaves you wanting more by the time it’s over. Adults are returned to the innocence of childhood as the cynical accretions of time are stripped away, and the primordial experience of wonder grabs hold once again. There’s good reason why people cannot get enough of Mike’s magic. One day, a few years ago, Mike shared with me a longstanding dream that had been brewing beneath the surface, and was now bubbling over with the irresistibility of an idea that could no longer be ignored. Mike had a desire to write a children’s book, and he shared the storyline with me. As he spoke, he actually had several really good ideas, all involving children as characters, friendship, magic, and the central theme of believing in oneself. Through a fortuitous series of events, Mike had the opportunity to pitch his ideas at Feiwel and Friends after several rejections from other publishers (“Great stuff, but nobody knows you…”). “Nine-year-old Mike Weiss slumped in a hard chair outside the principal’s office, Fourth grade was supposed to be a fresh start, but he was right back where he always was. Every year since kindergarten, at least once a week. In trouble. The story tells of a supportive (and not punitive) teacher and principal, kindly secretary in the principal’s office, loving parents, and Mike’s new friend, Nora, who accepts him as he is and complements his personality. It involves a bully, Mike’s nemesis, and tells of how Mike and Nora discover a magic shop, whose keeper takes Mike under his wing and begins a mentoring relationship. Throughout, the reader is entertained by Mike’s ups and downs in school, cheers him on as he finally finds mastery in something nobody else can do, bedeviling his nemesis by showing strength and proficiency in an area where the bully cannot top him, and soars to new heights with Nora as the wind beneath his wings. The theme throughout is the simple, powerful admonition: Believe! 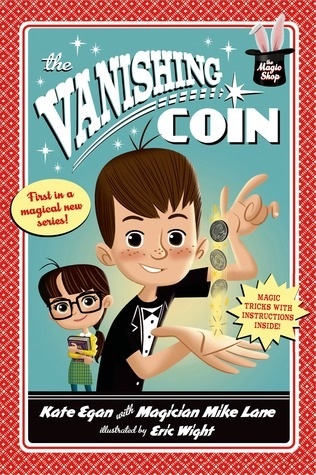 Throughout the well-illustrated book the readers are given a peek into The Book of Secrets, as they are shown several of the magic tricks performed by Mike Weiss. That’s part of the genius in this series. By teaching the protagonist’s tricks, which are easily mastered, the reader joins the author and Mike Weiss in the shared experience of bringing wonder to family and friends. And that’s just the first book in a series that develops the story and teaches new magic, new life lessons. To know Mike Lane is to know the secret of what is rapidly developing into a runaway success. He is a profoundly good, loving, and decent husband and father, with a wife who is his equal in every way. The story of the protagonist is really Mike Lane’s. The goodness, fidelity, encouragement, and gentle wisdom of Nora is Mike’s wife, Donna. The author and his work are one. At the rollout in Barnes and Noble on Staten Island three weeks ago, Mike sat with co-author, Kate Egan, (A professional author and editor with monumental credentials) and signed books for 4 ½ hours, with a line stretching around the store that never abated (wait time: 1 ½ hours). It was a George Bailey moment as the community turned out in droves for our beloved, “Magician Mike Lane.” Sales approached nearly 600 books, and Mike’s signing was the second largest in the history of the store. As advance word spread to the schools and bookstores where Mike went the following week on a national tour, the stores were chagrined when they had no books for signing, as the local schools snapped them up for their children in advance of Mike’s appearances. It’s a pleasure to take a break from the heaviness of bioethics and promote something for our children’s character formation that harkens back to the goodness and simplicity we parents and grandparents remember from our own childhoods. It’s a comfort to know that there are publishers who see the goodness for which we all clamor and are proud to present it. It’s refreshing to see a team that approaches children with an appeal to all that is good, and wholesome, and decent in human character and doesn’t adulterate it with an edgy agenda.